Candy Crush Soda is gaining popularity which is based on Candy Crush saga and if you are worried about bothering your Facebook friends every time you want a life or even end up paying for them, then worry not because with this trick you can get unlimited lives. The game is easy in the beginning but it gets harder and harder as the stages progress and that is the time you need lives, if you are a first time player then the initial stages are also hard but if you have already played Candy Crush saga earlier then the initial stages are very easy. So if you do not want to bother your friends or waste money to buy some extra lives then here is the trick to get Unlimited lives in both Android and Apple iPhone devices. This is not an APK file which you will be installing but a simple trick to get past the Candy Crush Soda gameplay. All you have to do in your iPhone or Android is to advance the time on your android or apple smartphone to make Candy Crush Soda game to think that you have waited for amount of time you need to get a life. If you need to wait 10 minutes to get a new Life then advance your time by 10 minutes. Now you can see that you have new lives waiting for you to play. You can do this whenever you want a new life and then change the setting back to set automatically if you want to. There are many modes in Candy Crush Soda Saga game where you cross the bears above the marking by filling the board with Soda in SodaBears Stage, and the others are Soda stage, Frosting stage, Honey Stage and Chocolate stage. 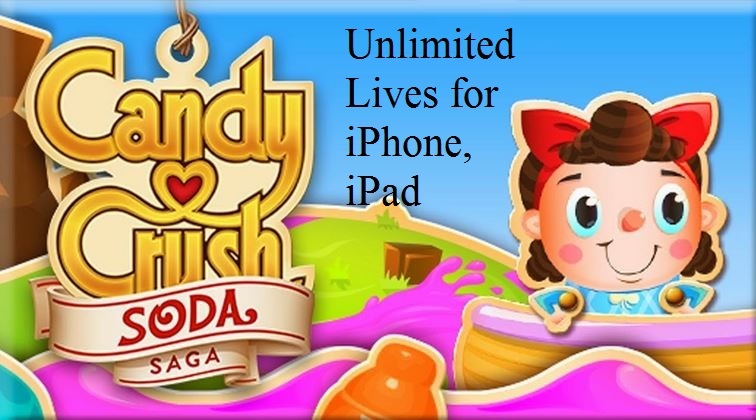 There are other options to get unlimited lives like we have showed for Candy Crush Saga by installing the App through APK file in your Android device but that will not work for Apple devices so this is the best and simplest way to get free lives whenever you need one.